Guest blog from Ven: Jacqueline Andreozzi, a PhD candidate at Thayer School of Engineering at Dartmouth College, blogged on her experience at the Biophotonics Graduate Summer School on the island of Ven, off the southern coast of Sweden, 6-13 June. SPIE, the international society for optics and photonics, and COST, the European Cooperation in Science and Technology, are among sponsors of the school. 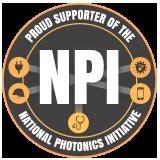 Also supporting the school are DTU Fotonik, Technical University of Denmark; Lund Laser Centre; NKT Photonics A/S; Royal Swedish Academy of Sciences, through its Nobel Institute for Physics; and Thorlabs. Indeed, the school provided lagom in every aspect of the week, from the scholarship, to the recreation, to the people present and the food prepared for us; everything seemed just right. 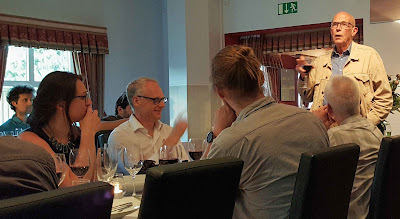 The school founders, Stefan Andersson-Engels (Lund University) and Peter Andersen (Technical University of Denmark), achieved a balance in programming which made it one of the most profitable weeks of my academic career in regard to both learning new material and networking with my peers. Unquestionably, the lecturers chosen for the school were indeed leading experts in their respective subfields. Over the final three days, students had the privilege to hear lectures from Katarina Svanberg (Lund University), Kishan Dholakia (University of Saint Andrews), Wolfgang Drexler (Medical University of Vienna), Sune Svanberg (Lund University), Eric Potma (University of California, Irvine), Bruce Tromberg (University of California, Irvine), and Paul French (Imperial College London). While all the teachers were charismatic and engaging, one of the highlights for me personally was the lecture by Dr. Katarina Svanberg on Wednesday morning, where she conveyed her clinical experience in cancer treatment. Asserting that “we have responsibilities as scientists to be strategic in our research,” her talk imparted compelling perspective to both the humanitarian potential of our work, as well as the scope of health issues that impact people around the world. She is a truly inspiring individual, with a kind heart, sharp wit, and admirable outlook regarding her fellow citizens of this world. 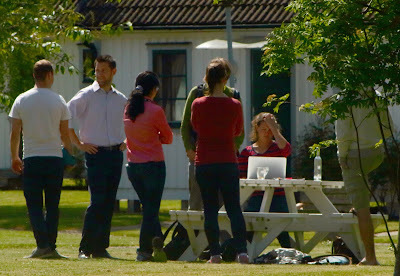 After Dr. K. Svanberg’s morning lecture block, students had the afternoon free to explore the island and connect with peers. Despite the absolutely beautiful weather tempting bike rides to the beach, most students elected to put the final touches on their entrepreneurial pitch presentations. Each “company” was formed from random assignment of sleeping cabins, and had less than three days to develop a marketable product or idea based on the skills and talents of the six to eight students in the allocated group. As further incentive to participate, Eric Swanson (Acacia Communications, Inc.) offered his enterprise acumen as a resource to any team wishing to continue on to the SPIE Startup Challenge held at Photonics West (any interested individuals should contact Dirk Fabian, SPIE Startup Challenge Coordinator). With 30 minutes until the start of the competition, company Unitissue makes final preparations. Dr. Swanson and Dr. Andersen led the evaluation panel as each of the eight newly-formed companies had seven minutes to pitch their ideas, followed by an additional seven-minute question-and-answer period. Enterprises such as Unitissue, Sun Watch, and eyeSafe took the stage in front of their peers to convince the “venture capitalists” (i.e., our resident expert lecturers) to invest in their proposals. With nearly unanimous participation from the students, the competition was very well received, and I hope it becomes a new tradition incorporated in future iterations of the summer school. Eric Swanson (right) questioning entrepreneurs Abel Swaan and Anat Vivante. The school wrapped up Friday night with a lovely gala reception. Since “life is a competition,” as Dr. K. Svanberg was quick to point out, only a few individuals had the honor of being independently recognized, despite the widespread talent undoubtedly present. Five students (names to be posted on the Biophotonics ’15 website) out of 58 were recognized for their work during the poster presentations conducted earlier in the week. In addition, student company Cardiac Fast Check took home the highly coveted entrepreneurship prize. Further inspired by Dr. K. Svanberg’s words, several students took it upon themselves to initiate an impromptu ballot for the premier lecturer. This honor (along with a small gift of appreciation) was bestowed on Dr. Dholakia, for his exceptional, animated manner of explaining the complex intricacies of manipulating matter using light, which quite evidently resonated well with the students. Sune Svanberg making a closing statement at the Friday night gala dinner. Sitting down to dinner on Friday night was a surreal experience -- one of those instances where it felt like the school had just begun, but at the same time like we had always been there, talking over our group meals on topics ranging from optical coherence tomography to the Swedish infatuation with caviar. That strange dichotomy persists now, less than a week later, as I reflect back on the many amazing, accomplished, and driven people with whom I had the opportunity to interact, and reinforces my conviction that all aspects of the experience were, for me and I expect many others, lagom. ‘People’s Choice’ highlights: Go solar!